Over much of the past decade, Mexican immigrants have been returning to Mexico at a faster rate than they have been arriving in the United States, according to a Pew Research study. Family reunification, immigration crackdowns and new employment opportunities south of the border are some of the reasons for the shift in immigration. 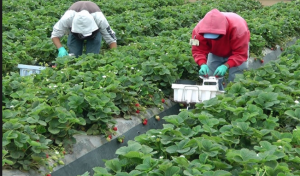 Now, California growers are struggling to fill the nearly 500,000 farm labor jobs in the state. Growers are increasingly relying on foreign guest workers, having recruited 11,000 last year, which marked a five-fold jump over five years. Likewise, growers are paying farm workers higher wages and are even starting to roll out benefits packages for their laborers. Many Central Valley growers are responding to the worker shortage by switching from labor intensive crops, like grapes and vegetables, to almonds, which are mechanically shaken from trees. Asparagus grows are often moving to Mexico, where it is cheaper to farm. Thus far, machines are failing to duplicate human judgment and dexterity in harvesting asparagus. But, other crops are becoming increasingly picked by machines. The wine industry has reengineered the bulk of its vineyards to enable machines, which span vines like a monorail, to strip them of grape clusters or leaves. The Watsonville-based berries company Driscoll’s is backing the innovation of a berry picking machine called the AgroBot. Developed by a Spanish inventor, the AgroBot uses computer-driven sensors, graspers and cutters to pick berries. During trial runs in Camarillo this spring, the AgroBot picked more than 50 percent of the ripe berries. In the lettuce industry, machines are being developed to slice heads and leaves and to thin the fields. The computer-guided See and Spray machine eliminates the need for workers to pull seedlings over with a hoe in order to create optimal spacing. The machine is one of five robotic thinners currently deployed over thousands of acres of summer lettuce in the Salinas Valley. Small crews are still needed to thin the areas the machines miss, but the amount of hard labor, and particularly hoe strokes, needed to grow lettuce is decreasing. Dont we have an over population of people in prison? Pick food and get time off? How about the able bodied homeless people? There are people resources to tap but will we? Robots picking food is another job killer. This is a good thing. I don’t care who you are – this kind of work is punishing.